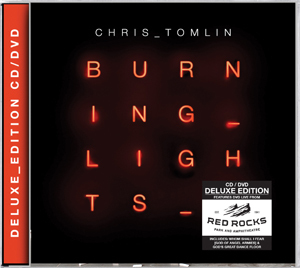 At the start of the year, acclaimed worship leader Chris Tomlin released his latest studio album 'Burning Lights'. Now he offers the 'Deluxe Edition' which in addition to the original album also features a full-length DVD of his live concert experience recorded in Denver. Read More At the start of the year, acclaimed worship leader Chris Tomlin released his latest studio album 'Burning Lights'. Now he offers the 'Deluxe Edition' which in addition to the original album also features a full-length DVD of his live concert experience recorded in Denver. Opening with the familiar moody keyboard tones, dim lighting, and Chris Tomlin's shadow covered figure - the DVD quickly bursts into life with 'God's Great Dance Floor'. This high energy party anthem looks and sounds fabulous. The famed Red Rocks amphitheater stretches out in front of the stage, with steeply banked seats packed full of dancing and singing fans - with those stunning natural rock formations dominating the skyline, soaked in red lighting. Chris and his band are alive with energy, jumping and bouncing their way through the song. In fact Chris probably covers more ground across the stage than the average footballer does during an entire game. Addressing the crowd, Chris jokes "You may not be the dancing type - too bad!". Before long he's encouraging even the grand parents in the crowd to join in the dancing - with an on stage DJ stepping out from his decks to demonstrate some nifty foot movement for everyone to copy. The infectious chorus is just perfect for a setting such as this. "You'll never stop loving us no matter how far we run. You never give up on us, all of heaven shout let the future begin - I feel alive on God's great dance floor". As over-dubbed rap lyrics from Lecrae echo out from the large stage, the band move into the close-your-eyes and lift-your-hands anthem, 'Awake My Soul', with the renowned rapper featured on the video screen to dramatic effect. Director Andy Hutch (Delirious, Tim Hughes) has done a great job here, the video production is top quality, with flowing motion around the stage and plenty of different camera angles providing views from every imaginable vantage point. Likewise the lighting floods both stage and crowd beautifully. There are no fancy gimmicks, no over the top lighting rig, forced stage design or domineering props. This is just a singer with his band and a bunch of worship songs - focusing all the attention on God. Positioning himself firmly in contention for a slot on the stand up comedy circuit, Chris cheekily coaches people how to join in with just the "oh-oh-oh" part of 'Lay Me Down'. "This is for all the bad singers - you know who you are! The people in front of you know who you are! Don't worry about the melody, you're not going to find it" he teases. The thing that really strikes you, watching Chris lead this huge crowd in some of the most exciting worship songs of the modern day, is just how much he's enjoying himself. With a massive smile fixed on his face at all times, Chris shows just why he is the best man in the world right now at leading a crowd in worship to God. It all makes for an incredible visual, musical and spiritual extravaganza. Singing probably one of my favourite worship songs of all time, Chris dips into his back catalogue for the acoustic 'Indescribable', sung under the stars as he sings "You placed the stars in the sky and You know them by name". It's just an incredible, moving, emotional moment. This song is poignantly performed from in the midst of the crowd, rather than on stage, and as he stands there surrounded by thousands of people holding aloft tiny beacons of light you can almost feel the spine tingling sense of awe at God's creation. Sat at the keyboard, Chris performs a wonderful solo rendition of recent song 'Sovereign' before the rest of his band return to stage for the hit worship anthem 'Our God'. Complete with it's strong drum rhythm and floaty guitar riffs, this crowd-singalong number is steeped in celebratory praise. Continuing with another of his songs most loved by churches, Chris leads the at times sombre, at times triumphant, 'Amazing Grace (My Chains Are Gone)'. Seeing the large crowd singing those timeless words is incredible and yet another strong highlight of this brilliant DVD. One surprise inclusion is the guest appearance on stage of singer Kari Jobe, who delivers a flawless version of the exquisite 'Revelation Song'. Every time I watched this it gave me chills, such is the quality of the performance and the visual images conjured up by the incredible lyrics. "Clothed in rainbows of living colour, flashes of lightning rolls of thunder. Blessing and honor strength and glory and power be, to You the only wise King." Returning for an encore, Chris performs another of his 'Burning Lights' album tracks 'Whom Shall I Fear [God Of Angel Armies]', before perhaps his most widely known song of all, 'How Great Is Our God'. As the song closes, the cameras soar over the top of the crowd who can be seen singing with eyes closed and arms outstretched in worship. The credits start to roll, but before you hit the off switch stay tuned for what can only be described as a club remix of 'God's Great Dance Floor' as Chris, the band and crowd launch into a bouncy-ball filled party! I've got to be honest, when I put this DVD on I envisioned this being a very short review - something along the lines of: nice songs, not bad for a bonus disc. Yet as I watched and listened I became totally and utterly enthralled in what must be one of the most incredible live worship concert recordings ever made.